Monday saw the floodgates open. After the (relatively) gentle decline of last week, and a fairly lacklustre Asian and European session, the US bell saw a classic crash. 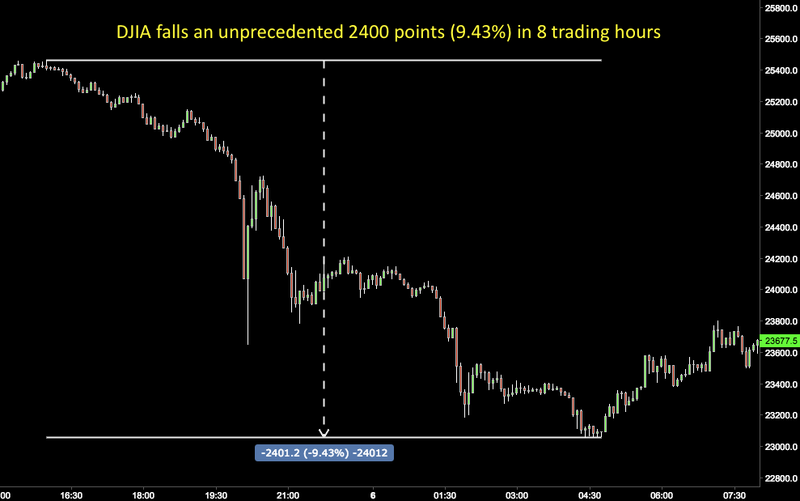 SPX fell 165 handles (5.99%) during the cash session and indices around the world followed suit. The DJIA was at one point down over 1,500 points, and it was the largest one-day fall in points terms ever, and the largest in percentage terms since the 2008 crash, exceeding even the similar event on Aug 24, 2015 (the last time the VIX ticked higher, it hit 50.3 today, compared to 17.9 on the previous Friday’s decline). Commentators blamed rising 10-year Treasury Yields, which are at four year highs. They dropped a stunning 12bp as the market crashed. Gold was up in line (at last), although only by 0.64%, its first real test to confirm the disconnect as a safe haven that we have seen in the last year. The day in currencies was very calm by comparison. Despite the bond yield drop, DXY was up a gentle 0.56%, although this masked, as you would expect, a substantial (0.70%) appreciation of JPY. Oil was also down, continuing the slide from Friday’s high. The news releases of the day had no bearing on the market. It was Turnaround Tuesday for all indices, but not before SPX fell a further 2.56% in the Asian market from the cash low, to touch a four-month low, and with DJIA shedding a shocking further 930 points from the close. However as the volatile day progressed, with movements we have not seen for over two years, with DJIA making a 650 point rally in the first 30 minutes of the cash session, and routinely moving 100 point per hour, the markets closed with SPX up 1.7% and DJIA up 2.3%, having recovered about 75% of the previous days losses. DAX, NKY and FTSE showed similar turnarounds. The forex market also turned, with all currencies except GBP and JPY appreciating, and Gold reversing. Oil was flat on the day. AUD fell after the RBA rate hold at 0330, but recovered during the European and US sessions. The volatility continued on Wednesday, with NKY losing 500 points in the Asian session, although DJIA and SPX futures only faded slightly. After then rallying to the highest point since the Monday crash, they gave up some ground and finished the day down. The VIX however was back at 27, as hyper volatility receded. DAX and FTSE were actually up again on the day, partially because their cash sessions closed at 1630GMT when the high point was reached. USD was up again against all currencies except JPY, with NZD being a particularly poor performer, dropping 55 pips on the rate hold at 2000, after spend all day falling. Gold was down to a one-month low and yields were sharply up by 9bp, both in line with a stronger dollar. Oil continued to retreat from last week’s highs. There was no let-up on Thursday, the closing fade on the previous day continued, with VIX back above 33. SPX ended 3.8% lower and DJIA was off 4.2%, over 1,000 points. FTSE (down 1.5%), DAX (down 2.6%) and NKY (3.02%) followed suit and tumbled. It was risk off today with the yen and Gold both up (although not hugely). This continuing lack of flight into safe havens (CHF was only up 0.09% on Monday) has been an interesting feature of events of the last two weeks. 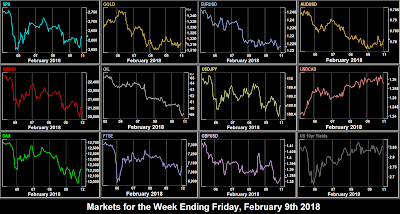 The currency picture was oddly (given the completely different equities picture) much like Tuesday, with GBP and JPY up, everything else down against USD, to deliver a flat DXY. This time there was a reason with sterling; the BoE held rates as expected, but upwardly revised their view of future economic growth. Cable put on an immediate 161 pips (1.16%), although this rally almost completely faded, and the pair ended the day mere 0.25% up. Yields carried on rising, briefly approaching last week’s four-year high, but ended the day flat. Oil continued its week-long fade. Interestingly, CNY was down 0.9% against USD, its biggest fall in over a year. In case you don’t know, the terms renminbi and yuan are interchangeable. (Strictly, renminbi is the currency, and the unit is the yuan, so maybe like sterling and pound, but all other currencies use the same word for both). 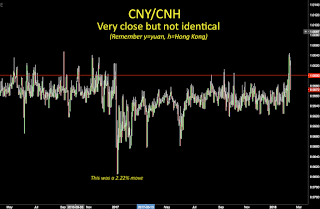 However, the onshore version (CNY) is not the same as the offshore version (CNH), the latter being allowed to be owned and traded by foreign citizens in Hong Kong and elsewhere. Although the exchange rate is around parity, it does vary as you can see from this chart. Friday was another highly volatile day, with an almost perfect, deep V-pattern in equities during the US session. DJIA fell 750 points in US morning, only to then rally over 1000 points in the afternoon, before fading slightly to end the day a modest 0.91% up. After a relatively mild Asian and European session, the other indices did likewise. Interestingly DAX did the move twice, first falling 250 points and recovering all then falling 315 points to similarly recover. An 1130 point journey to finish only 90 points up. Currencies were again mixed, with DXY’s making a tiny 8 point move up. There was a small fall in EUR, the largest DXY component, and a larger (0.8%) dip in GBP as EU negotiator Barnier warned that a transition deal for Brexit may not be reached. JPY, for once was fairly flat on the day. CAD was unusual. 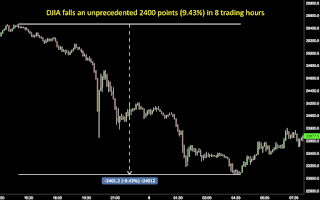 The NFP figure at 1330 was a big miss (-88k vs +10k) and the loonie instantly fell by 88 pips (0.70%). However, the now all-important average hourly earnings rose by 3.3%, the strongest figure in nearly two years, and traders changed their minds quickly, and bid the currency up in the next 30 minutes by 128 pips (1%). This then pared back, and CAD ended up 0.19% up on the day. The volatility did not extend to Gold and Oil, which were slightly down on the day, and yields were flat. 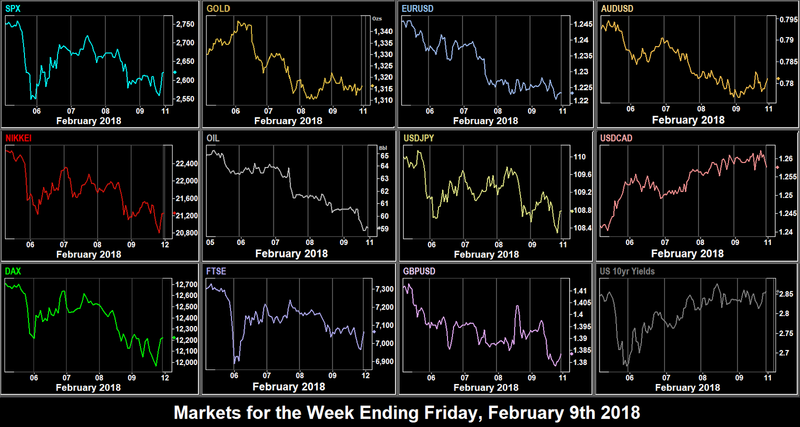 The most volatile week since January 2016 ended with relatively little USD and yield movement, but with indices posting their worst week since that date. The sharp drops from last week accelerated in moves reminiscent of January 2016. DXY put on 1.27% the best week since the week after the Trump election. The VIX hit its highest level since August 2015, and at one point DJIA was down 9.32% on last Friday’s close. However forex was largely stable during all this. USD was up across the board, except for NZD, so the best forex trade would have been to sell EURNZD for 2.18%. NKY was the best index short down 7.31%, but shorting Oil (-9.24%) would have been the best overall trade. Cryptocurrencies had another terrible week. Bitcoin was down to $6,000 at one point, and at the time of writing is back at $8,400, which is 11.5% lower than the $9,500 snapshot figure I referred to last week. Whereas this figure exceeds the whipsaw indices movements, in crypto terms that is relative stability. Monday is quiet on data, and Japan is closed for the National Foundation Holiday, as in Brazil and other South American markets for Carnival. RBA Assistant Gov Ellis speaks at 2150. Trump’s (bipartisan) budget plan is due to be presented to Congress. Indian CPI is released at 1200. Tuesday’s big story is UK CPI. The pound was unable to hold its rally last week after hawkish economic growth forecasts by the BoE, so it remains to be seen how it will react to this important indicator. Fed Mester (hawkish, voter) is discussing monetary policy and economic outlook at 1330, with a Q&A to follow. Carnival continues in Brazil and elsewhere, and the Indian NSE is closed for Mahashivrati. Hungarian CPI is released at 0800. DJIA heavyweight KO reports before the bell. No holidays on Wednesday, and the data starts to flow, starting with German inflation and Eurozone GDP in the European session. Also Bundesbank President Weidmann (hawk) speaks at 0800, followed by ECB Exec Member Yves Mersch (hawkish, crypto-sceptic) at 1020. The SEK (4.2% of DXY) rate decision (est -0.50%, prev -0.50%) is at 0830. The main story of the day is the double release at 1330 of US Retail Sales, and the all-important US CPI. US inflation is probably the most important item of the week. A miss would dampen rate hike expectations, and therefore bond yields, the movement in which has been linked to the recent equity volatility. Thursday’s Asian session opens with the Australian ‘NFP’. The estimate at 15k is less than half last month’s print. A miss of this lower figure can only be bad for AUD, already 4% down from the late January high. RBA Governor Lowe testified to the Australian House Economics Committee (in Sydney, not Canberra) at 2230. In Europe, we have three ECB speakers, Mersch (hawkish) at 0815, Praet (dove) at 1045, and Lautenschlager (hawkish) at 1200. Over the pond, TreasSec Mnuchin is before the House Ways and Means Committee at 1500, and BoC Deputy Gov Schembri is on at 1830. 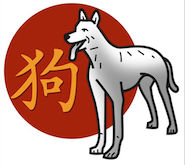 The Chinese markets close today (half day to 0400 in Hong Kong) for the Year of the Dog, which starts on Friday. They will not reopen until the following Thursday (Feb 22). Singapore is also closed. Happy New Year to all our Chinese readers wherever in the world you may be. Friday is another light news day. UK Retail Sales (inflation proxy) is normally important, but less so this week, as the actual CPI figure precedes it by three days. ECB Coeure speaks in FYR Macedonia at 0820. The only US data worth watching is the University of Michigan sentiment index at 1500.